A website of Zamfactor Ltd. In this text by Bert Witkamp some notes on the genesis of artistic printmaking at the occasion of the August – October 2013 “Graphic Art of Zambia” exhibition at the Art Gallery of the Choma Museum. The exhibition is a joint production of Zamfactor Ltd. and the Choma Museum. This text is based on the information in the leaflet accompanying the exhibition. Also published as Art in Zambia series no 6 at the Art in Zambia Blog. 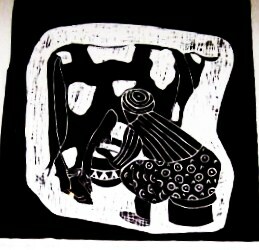 You can also read about participating printmakers at the Choma Museum Art Gallery website. Go to http://chomamuseumartgallery.weebly.com and once there click on the current exhibition tab. There are several types of graphic artists: printmakers, draughtsman, commercial designers, book illustrators and others involved in industrial printing. These notes are confined to graphic art as fine, hand printed art. The development of hand printed art is the main focus of this exhibition, supplemented by graphic work which is not printed but drawn. Zambia’s history of printed art is young and starts just before Independence with the arrival of Cynthia Zukas in what at that time still was Northern Rhodesia. Born in the Republic of South Africa she obtained a BA in the Fine Arts at the University of Cape Town. At this exhibition you see five of her prints. She developed a naturalistic style, choosing subjects and themes out of her surroundings. Mrs Zukas has been supporting the arts in Zambia in many capacities: privately, as a member of the Art Centre Foundation, co-director of Mpapa Art Gallery, Chairlady of the Lechwe Trust and in many more functions. The Lechwe Trust, founded in 1987 as of that year plays a major role in supporting Zambian art and artists. She made her etching press available to upcoming graphic artists - we’ll come back to that when discussing the Lusaka Artists Group. In this exhibition we stress her pioneering contribution to printmaking in Zambia. The second major formative influence was by Henry Tayali (1943 - 1987). He was a painter, graphic artist and sculptor. Tayali was one of a small number of indigenous Zambians privileged to academic education in the arts upon Zambian Independence in 1964; of these he enrolled at the best schools and was one of the very few who passionately continued to be productive in art after his academic studies. He obtained in 1975 a master’s degree in fine art at the well known Dűsseldorf Art Academy, the school where he learned most of his graphics. Tayali mostly made woodcuts, but also worked in lino and did several designs in silk screen. Much of his work is in a robust, expressive style in which the dominant figures clearly stand out against a sketchy back ground made up of patterns of gouged out lines that support the sense and feeling of the subject. Themes often were taken out of daily life, at times referring to hardships of the poor or in a form of social commentary. He also experimented with a more abstract manner of graphic image formation. In such work figurative elements are not more than clues in an all over visual scene made up of colour blots and linear structures that seek to be expressive of emotion rather than of observable reality. 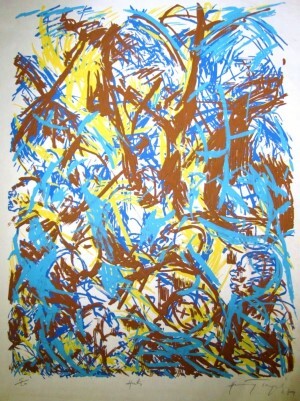 This near-abstract work is mostly done in silkscreen. The third party shaping Zambia’s advent into graphics are the members of the Lusaka Artist Group (as of 1977 renamed Zambia Artists Group or ZAG). The group was brought together by Bert Witkamp, also writer of this article, during 1975 and 1976. Bert had arrived in Zambia in 1975 from the Netherlands, had a background in painting, monumental design and graphic art, and was looking for fellow artists to work with. The first of these was Fakson Kulya, followed by Patrick Mweemba and David Chibwe. The group was assisted in 1976 by the Art Centre Foundation which facilitated a classroom/studio at the Evelyn Hone College in Lusaka. Cynthia Zukas made her etching press available and the result was a very substantial production of graphic art, mostly lino cuts. Lino cutting was new to these artists and it took some time before each developed his own style in a consistent manner. Below a brief introduction to the members of this group. Fakson Kulya was born in Luanshya rural in 1946 where he also died around 2003. He was the first member of the Lusaka Artist Group recruited by Bert Witkamp. They exhibited in December 1975 at the Lusaka City Library. Kulya had no formal education in art and did much of his learning at the Lusaka Artists Group / Art Centre Foundation workshop at the Evelyn Hone College. He was a sculptor, draughtsman, painter and graphic artist. Much of his two-dimensional work is inspired by folk culture and folk life. He was an original artist with an abundant fantasy creating figurative, humorous and sometimes bizarre imagery that often had a story to tell. You can read more about Fakson in this website under Internet Publications and also at the Zamart Blog. David Chibwe (1948) now is one of Zambia’s senior artists. He is one of the first members of the Lusaka Artists Group and started printmaking in 1976 at the Evelyn Hone College Workshop facilitated by the Art Centre Foundation. He is a versatile man; doing painting from small to large, making prints working in lino, and, when need be, does sign writing to have some money in the pocket. His prints are inspired by daily life in compounds; a life he knows well, resulting in naturalistic imagery of Zambian urban and rural folk life. Patrick Mweemba (1946) is one of Zambia’s senior artists. He paints, sculpts and makes prints. His printmaking started in 1976 when he joined the Lusaka Artists Group. Since then he has built up a large oeuvre of lino- and woodcuts. He developed his own manner of colour printing. He owns Chisungu Graphics and runs a small gallery at Tazimani Handicraft Centre, 14 km up Great North Road from Choma. He also farms and advocates conservation farming. His subjects in art arise from the incidents and accidents of daily life; now cast in his original imagery. http://artblog.zamart.org/2011/03/witkamp-gijsbert.html. - just a click away. The collapse of the Zambia Artists Group in 1981 and the subsequent closure of the studio at the Evelyn Hone College did not spell the end of a prolific Zambian graphic art production. The (former) ZAG members continued to make prints, so did Tayali, Zukas and Macromalis. New artists entered the graphic scene. Most of these are listed below. Lutanda Mwamba’s (1966-2014) journey into printmaking took off with lino cuts. His talent showed immediately by prints of outstanding, yet deceptively simple composition; prints both colourful and atmospheric. Studies in the UK turned him on to serigraphy - silkscreen printing - in which he was a master. He continued to experiment in graphic techniques and also ventured into painting. Jonathan Leya (1958) is a professionally trained graphic designer who presently mostly does commercial work. He also is extensively involved in exhibition design and contributed greatly to the series of brilliant exhibitions at the Choma Museum Art Gallery during 1993 - 1997 under the curatorship of Grazyna Zaucha. He is a talented graphic artist making silkscreen prints and lino cuts. He runs a company called Dreamgraphics. Agnes Buya Yombwe (1966) is one of Zambia’s outstanding artists - generally because of the quality of her work and specifically because of her originality in giving form and meaning to her art being “African.” Location and identity are important in her work. She and her husband Lawrence Yombwe, also an accomplished artist, own and manage Wayi Wayi Art Gallery at Livingstone. They also provide art classes and host art events. Patrick Mumba (1961) is a painter and print maker, well known in Zambia and abroad. He has been extensively exposed to the international art world. He manages his own gallery called New Residence Gallery at Lusaka, has been active in art organizations and is Head of the Art Teachers Diploma course at the Evelyn Hone College. And there are others and more to come. Graphic art now is well established in the spectre of Zambian visual arts as you can see at this exhibition. Note: Not all major Zambian print makers have been listed above - notably Andrew Macromalis, Adam Mwansa and Clement Mfuzi are absent. Each of these has developed a style of his own. The reason is that I could not timely secure suitable works by these artists for this exhibition. We want clean water. Etching by Cynthia Zukas. Untitled woodcut by Tayali with dancing figures. 1986. Huts. Silkscreen print by Tayali, 1974. Sitting on a bad Branch. Linocut By Kulya, made about 1988. Children at the Front Yard. 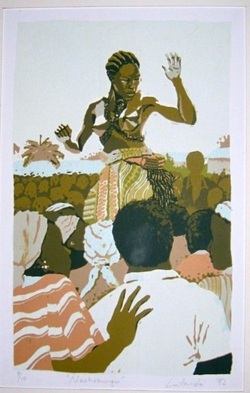 Lino cut by David Chibwe, made in 1980. After the Shot. Lino cut by Patrick Mweemba. Plus Minus. Lino cut by Bert Witkamp. Around 1983. "Nachisungu." Silkscreen by Lutanda. 1992. Combs in lino cut by Jonathan Leya. About 1996. "A Working Woman." Lino cut by Agnes Buya. Gender. 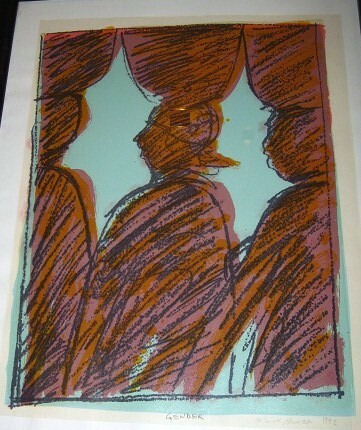 Silkscreen print by Patrick Mumbwa.